Predatory species compete with humans for the use of resources such as livestock and an important tool for managing possible conflicts is damage compensation schemes distributing the costs between those who benefit from conservation and those who suffer the costs of damage. The 7th November issue of Science provided interesting news pertaining to the role of predation in the reindeer husbandry in Norway (http://news.sciencemag.org/environment/2014/11/whats-killing-reindeer). Herd of reindeer in corral. Photo: (C) Bård-Jørgen Bårdsen. The article points to the long standing conflicting views about what fundamental cause of losses of reindeer in Norway. While herders attribute losses to protected carnivores like lynx, wolverine, brown bear, wolf and golden eagle, ecologists attribute losses to overstocking and subsequent negative density dependence. In Norway, herders are compensated for losses caused by predation by the aforementioned protected carnivores. Not surprisingly, compensation in Norway is quite substantial, and the article reports that in 2011 herders received $11 million in compensation, roughly two-thirds of what they received from meat sales. Overall, these results fit well with the findings in my own paper, published in Human Ecology in 2011, that showed on a national scale predation compensation received by herders almost doubled from 2004 to 2007 while at the same time reindeer abundance reached an historical high level. Temporal abundance in reindeer abundance and predation compensation for the reindeer husbandry in Norway. Copied from Figure 1 in Næss, M. W., Bårdsen, B.-J., Pedersen, E., and Tveraa, T. (2011). Pastoral herding strategies and governmental management objectives: predation compensation as a risk buffering strategy in the Saami reindeer husbandry. Human Ecology 39(4):489-508. Pertinently, the same study also showed that received predation compensation one year (controlling for reindeer density) had a positive effect on herd size the next year. The changing relationship between predation compensation and reindeer abundance in Norway. 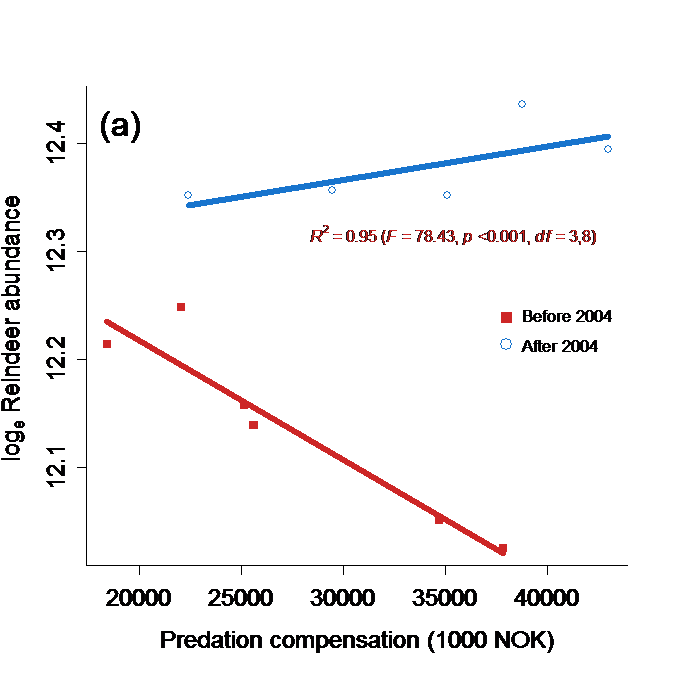 Copied from Figure 2 in Næss, M. W., Bårdsen, B.-J., Pedersen, E., and Tveraa, T. (2011). Pastoral herding strategies and governmental management objectives: predation compensation as a risk buffering strategy in the Saami reindeer husbandry. Human Ecology 39(4):489-508. In other words, compensation may increase the number of livestock kept by pastoralists: without compensation, an important cost connected to increasing the number of livestock is the probability that additional animals will be lost to predators (e.g. : Bulte and Rondeau, 2005). While compensation aims at reduce people-wildlife conflicts by compensating damages incurred by predation, it may have counter-intentional outcomes that in fact exacerbate the potential for conflicts. Studies have, for example, shown that predation has been found to be higher in heavily- or over-stocked areas and may also lead to surplus killing (see e.g. Wang and Macdonald 2006, Bagchi and Mishra, 2006). The question of compensation, or at least the design of effective compensation schemes, is important. Globally, large carnivores are declining in number due to the combined pressures of habitat loss, disease, hunting and persecution by humans (Weber and Rabinowitz, 1996, Atickem et al. 2010). Research suggests that the extinction of large predators has resulted in large scale ecosystem changes and may exacerbate negative effects of global climate change (Estes et al. 2011). Consequently, it is important to design compensatory schemes that reduce human-wildlife conflicts.